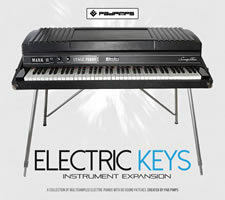 ‘Electric Keys’ is a multisampled recreation of three legendary electric pianos from the 70s; the Fender Rhodes Mark II, Wurlitzer 200A and the Hohner Pianet N, containing 80 ready-to-play instrument patches for the MPC X, MPC Live, MPC Studio, MPC Renaissance & MPC Touch. All patches can also be fully customised giving you control over many essential settings including tremolo and vibrato depth and rate, filters, effects and EQ. The Rhodes even includes an adjustable ‘tine’ control, a first for a native MPC Rhodes emulation. The collection comes with two separate installers; a dedicated version for 'standalone mode' use in the MPC X/MPC Live and a separate MPC Software Expansion installer for use in the Expansion Browser (compatible with both MPC Software 2.0 and 1.9), perfect for the MPC Studio, MPC Renaissance and MPC Touch.